Meaningful Engagement meets the needs of both your customer and your business by creating an experience that is both valuable and desirable. 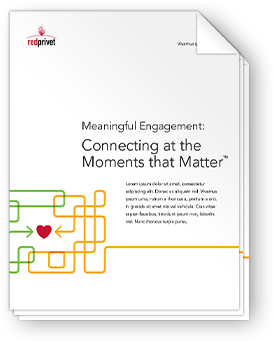 In this guide, we’ll teach you how to identify, connect and measure the moments that matter most and drive meaning into every engagement opportunity. Not every opportunity for customer engagement is the same. At Red Privet, we help your brand identify the Moments That Matter℠—those critical interactions where customer needs are met and customer loyalty is earned. We combine immersive research, thoughtful design and innovative execution to create meaningful engagement and deliver meaningful business results.